Sitelock, one of the world's leading website security companies, is using the DMCA to silence a vocal critic. Web design and services outfit White Fir Design has published several articles about Sitelock, but now the company has hit back by filing DMCA notices against screenshots included in White Fir's reports. 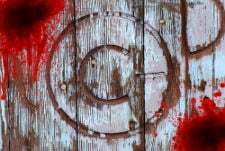 The takedown provisions of the Digital Millenium Copyright Act are most closely associated with alleged infringement in the file-sharing space. As a result, millions of notices are sent to a wide range of websites, not least Google’s search. As a recent case involving Warner illustrated, erroneous notices can prove controversial, but perhaps the most egregious examples involve efforts to silence critics under the guise of protecting copyrights. One such situation appears to be underway between two players in the website security sector. 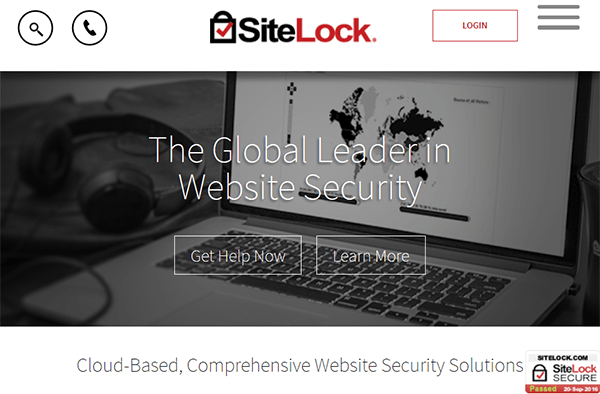 In the blue corner stands SiteLock, the self-professed “Global Leader in business website security solutions.” With more than 8,000,000 customers worldwide, it’s more than likely that its logo (shown bottom right in the image below) is familiar to readers. Sitelock’s product range is impressive but no matter what it does, the company cannot seem to impress White Fir Design, its rival in the blue corner. For the past few years, web design and security company White Fir has been publishing articles critical of SiteLock. In 2014, for example, the company published a piece declaring that Sitelock was poor at protecting its clients. This was followed by several others continuing on the same theme, including a May 2016 piece declaring that Sitelock was scamming its customers. Clearly, things were beginning to heat up. It’s not clear whether Sitelock disagrees with any of White Fir’s critique but the company has certainly noticed the articles published web outfit. That became evident this week when Sitelock filed DMCA notices against two pieces published by White Fir. “We have seen a lot of ridiculous stuff from SiteLock recently, but this has to take the cake,” White Fir said in a statement. 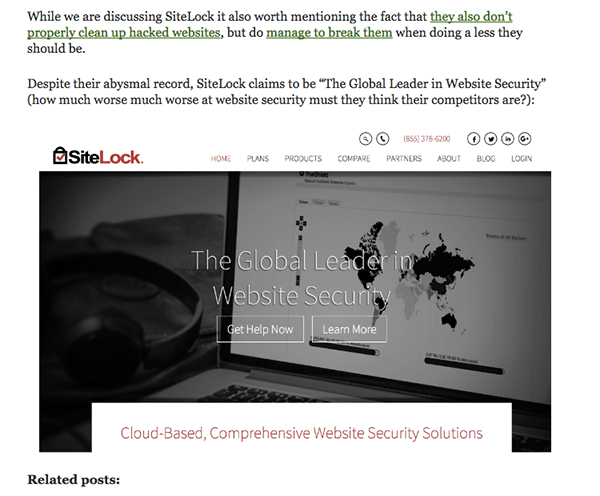 The screenshot posted by White Fir originally appeared in an article which claimed how Sitelock had placed their seal of approval on a site, despite it being dangerous for visitors. The screenshot has now been removed but a copy can be seen below. The resulting DMCA notice from SiteLock claims that White Fir’s use of the screenshot is infringing. “My name is Logan Kipp, I am contacting you on behalf of my company SiteLock, LLC. A website that your company hosts at IP *66.39.94.41 (WHITEFIRDESIGN.COM) is infringing on at least one copyright owned by SiteLock, LLC,” the complaint to White Fir’s hosting company reads. The second complaint Sitelock filed against White Fir concerned a piece published early September which alleged that SiteLock had reported certain versions of WordPress as having “critical” vulnerabilities when in fact they did not. To support their critique, White Fir included a screenshot of a table published by SiteLock. It’s clear that White Fir had the right to do so under Fair Use but SiteLock’s Logan Kipp felt otherwise, filing a complaint with White Fir’s host. “I request that you immediately notify the infringer of this notice and inform them of their duty to remove the infringing material immediately, and notify them to cease any further posting of infringing material to your server in the future,” SiteLock told the host. Quite why White Fir chose to comply with SiteLock’s takedown demands is unclear, as the usage of the screenshots is legal for the purposes of news reporting and critique. However, as White Fir point out, if the aim was to silence them, that has backfired. 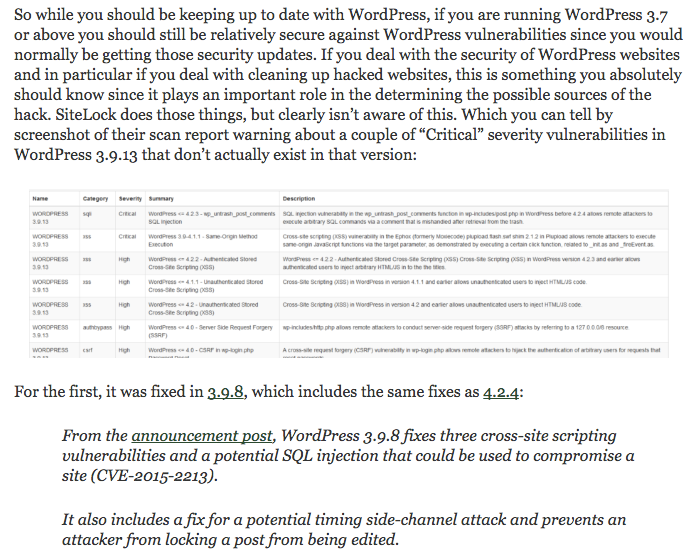 “What makes this even more ridiculous is [SiteLock] clearly now know that their post is showing that they lack a basic understanding of WordPress security, but instead of fixing their post, they are trying to hide you from seeing an image on our website,” White Fir explain. And so the DMCA wars continue….